A new home energy efficiency guide does the legwork for Muswell Hill householders to bring their home up to 21st Century standards of energy efficiency – whilst increasing comfort , reducing running costs, cutting carbon and maintaining character. The Muswell Hill Sustainability Group’s Homeowner Pack contains 60 pages of up-to-date information about insulation, draughtproofing, renewable energy. There’s also advice on Government incentives and finance, and unique sections on local planning rules and local trusted installers. The guide follows two well-attended 21st Century Homes exhibition and open homes events in the area which proved demand for accurate information on achieving a comfortable home which doesn’t cost the earth to run. A 21st Century home has comfortable indoor temperatures, fresh air rather than draughts, good natural and artificial light, plenty of hot water, and reduced energy bills. It may also generate electricity from solar electric panels. ‘Whether you’re planning a complete refit or just a lick of paint, paying professionals or going down the DIY route, it makes financial, practical and environmental sense to include energy-saving in your home refurbishment plans,’ explained Cara Jenkinson, the Sustainability Group’s Chair. ‘Now’s the time to act before new cupboards go up or new flooring goes down, before installing a new kitchen or bathroom or while there’s scaffolding up to repoint the walls or fix the roof’. The pack includes case studies ranging from Victorian to 1980s properties, including Stewart McIlroy’s end-of-terrace Edwardian house (right). ‘Our energy efficiency makeover focussed on draughproofing, windows, floors, wood heating, walls and solar energy. The result is a very liveable, low cost family house,’ he enthused. Some Muswell Hill estate agents have agreed to offer the pack to homebuyers, while the Londonwide Brickworks online agents are including a copy in the ‘welcome box’ they leave on the doorstep for new homeowners. 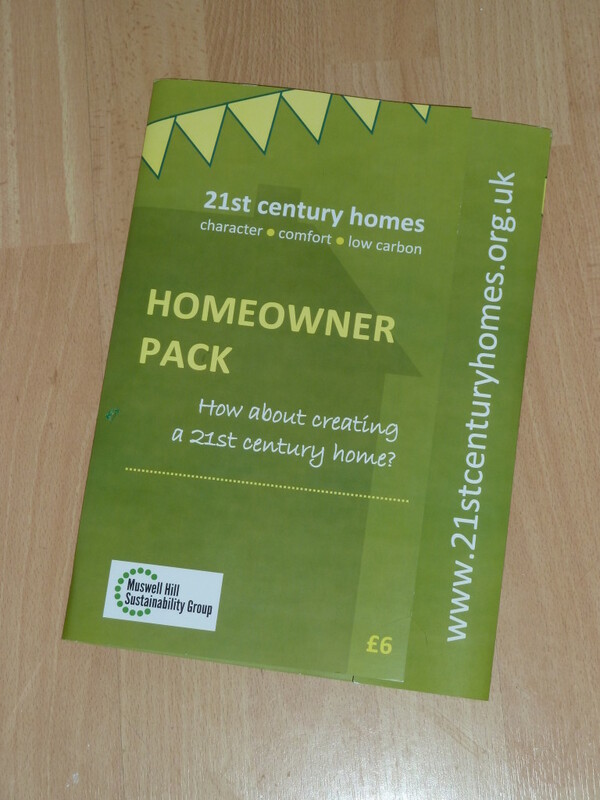 The Homeowner Pack can be ordered from mary@mhsgroup.org, £6 including postage.